QiJi 3.0 is a true traditionalist, a breed that is slowly fading away from prominence at the LEGO Hero Factory. Her fighting style involves melee attacks almost exclusively, with the only exception being a defensive concussion blast her shield is able to emit to help separate multiple enemies. She switches between multiple distinct forms of martial arts as needed to match the threats she faces. It is said that Qiji has studied directly under "an old friend and rival" of Mr. Makuro. QiJi's video is an homage to two eras of Chinese martial arts film making -- the early 1970s and the 1990s. 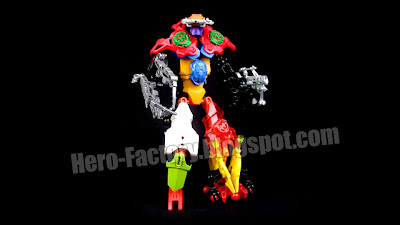 My last 4 MOCs, this one included, were all made at the same time, over the span of about 30 minutes one random evening. 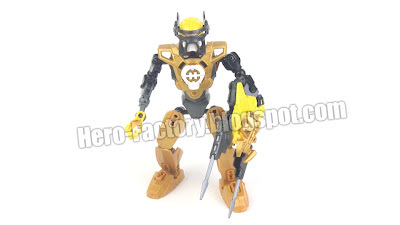 Onyx 3.0 is the worst enemy of any organized, confident group of villains, as he brings mass amounts of disorder and uncertainty. 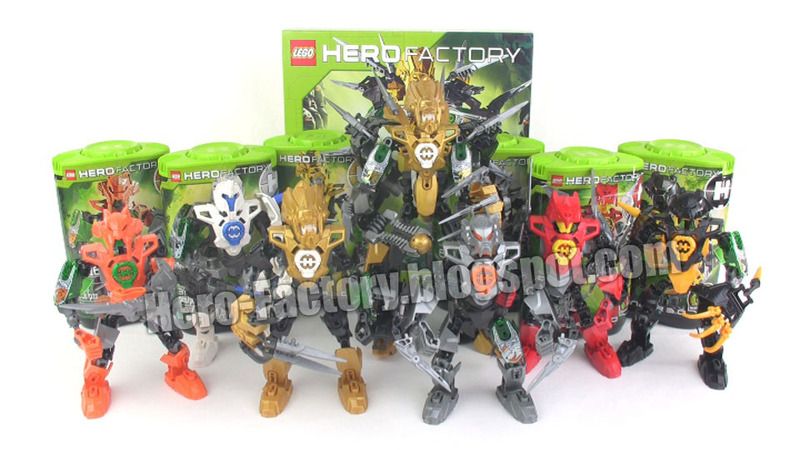 This LEGO Hero Factory warrior strikes deep behind enemy lines with devastating speed, precision, and power. Onyx is intensely stoic and speaks only when absolutely necessary, with the fewest words possible. When he stands, he stands perfectly still. When he moves, he moves slowly and deliberately, and yet there are times when he can seem to disappear in the blink of an eye. Details of his armor and weaponry are classified, but fellow heroes have been able to determine that the trident end of his double-sided polearm uses experimental phase resonance technology. It is possible that his armor does as well, explaining his ability to seemingly vanish into thin air. It is rumored that Onyx has regular secret meetings with Specter. There was once a mention of something being "out of order" within the Hero Factory. Ironically, Onyx does no nighttime missions. Onyx and Stringer have never spoken to one another. Every single piece used on the Onyx 3.0 model is fully black. 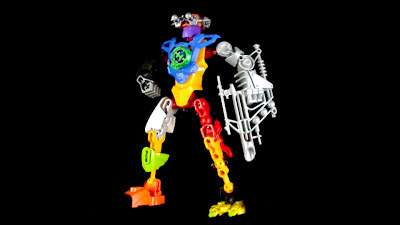 Introducing Boravus 3.0 from the LEGO Hero Factory, assigned to the Savage Planet missions. Boravus is a rule-breaking survivalist who will do whatever it takes to defeat his enemies and protect his comrades. 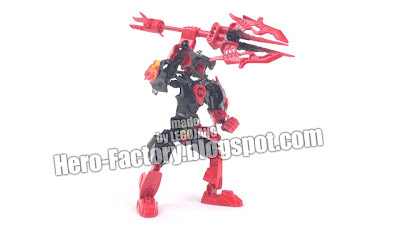 The Hero Factory has a strict policy prohibiting the use of corrupted Quaza weapons, yet Boravus uses two spikes of the outlawed material in his spear. When the spikes penetrate the armor of one of the Savage Planet villains, it is as if the creature is coming under the control of the Witch Doctor all over again. For a few seconds, the creature is nearly paralyzed as the energies flow through it and Witch Doctor's concentration is broken. This is when Boravus activates the secondary aspect of the spear, dual plasma rods, taking the poor villain out of commission for good. He uses a hook & dagger multi-tool, holstered on his left side, to remove Quaza implants from his fallen foes. Boravus also has reactive fire armor that can burn anything that strikes it with with sufficient force & speed. Yesterday's Hero of Tomorrow, the Lego Hero Factory's one and only Blanko, first seen in basic 1.9 form, has received his well-deserved XL-sized upgrade. Who cares that he was conveniently passed over for animal power updates? He didn't want to visit the Savage Planet, so why would he need to when he's officially "the most awesome anything, ever?!" 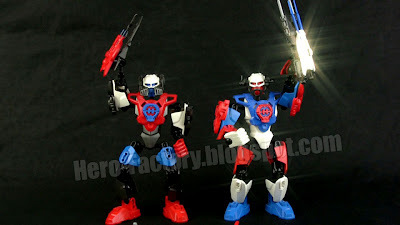 A super-quick teaser of 3.0 series Savage Planet Hero Factory hero MOCs on the way! This only shows bits of a few creations out of the 23 I've yet to publish! 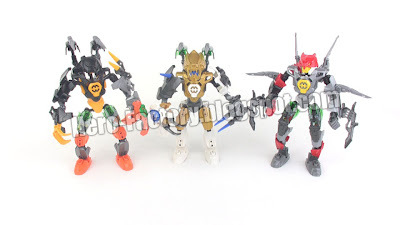 Stay tuned for more under LEGOJANG on YouTube including MOCs! Enjoy! Be sure to subscribe to LEGOJANG on YouTube to see all of the videos as they're posted (or as YouTube decides to make them available). Just one more normal-sized hero to go, Furno, followed by the huge Rocka XL! Others are already being rendered/uploaded already! More LEGO Hero Factory Savage Planet reviews on the way -- I'm doing them all! 29 comments - Post a response!